When Villanova meets Miami on Thursday in Louisville, Kentucky, Ochefu and Arcidiacono know what’s on the line. They take great pride in having played four years at Villanova. Over the last three years, the Wildcats have lost in the first or second round of the tournament. The Wildcats are experienced — plus they rank 15th in the country in scoring defense. They easily handled their first two opponents in Brooklyn with an 86–56 win over UNC-Asheville and an 87–68 rout of Iowa. Arcidiacono, a 6’3”, 195-pound guard, had 30 points and eight assists over the two wins. He will have to face off against two talented senior guards from Miami, Sheldon McClellan and Angel Rodriguez. Miami’s backcourt is dangerous, quick, and experienced. Fortunately for Arcidiacono, he will have some help down low from Ochefu. Miami is not a great rebounding team — the Hurricanes are tied for 249th in the nation in boards per game — and that is where Ochefu can take advantage. Ochefu, a 6’11”, 245-pound forward, is a monster on the glass. He will definitely stand out on the court in Louisville. In rounds one and two, he had a total of 23 points, 21 rebounds, and six blocks. Another team with strong senior leadership is Notre Dame, which will return to the Sweet 16 after losing 68–66 to Kentucky in the Elite Eight last season. The Fighting Irish will face Wisconsin in the East Region semifinal on Friday in Philadelphia. Auguste, a 6’10”, 245-pound senior forward, returns as a more seasoned leader. He made more than 85% of his shots (12-of-14) in Notre Dame’s two tournament wins in Brooklyn. He had a double-double in each game, finishing with 26 total points and 27 rebounds. He is currently the team’s leading rebounder (10.9 boards per game) and second leading scorer (14.3 points per game). He is considered to be one of the best pick-and-roll players in the county by leading sports analysts. Auguste can rebound his way to a win against Wisconsin if he can control the Badgers’ big man, freshman Ethan Happ. Last weekend, Bronson Koenig’s buzzer beater to send Xavier packing may have overshadowed Happ’s outstanding performance (18 points and seven rebounds), but he should not be underestimated. Auguste’s ability to shut down Happ will be critical for Notre Dame against Wisconsin. Auguste believes that Coach Brey expects more of him. “When things get tough, he wants me to step up and lead by example,” said the senior. 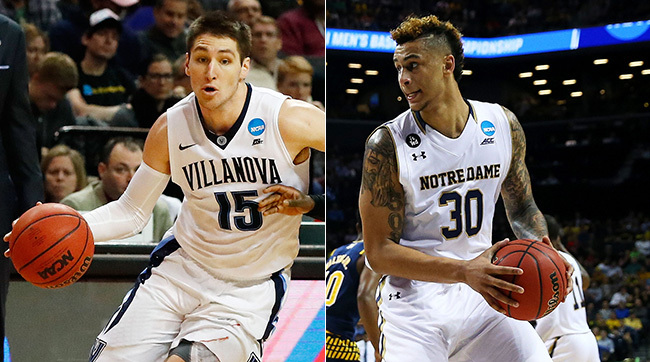 If Notre Dame heads to the Elite Eight again, Auguste will be the leading the way. Villanova plays Miami Thursday at 7:10 ET on CBS. Notre Dame plays Wisconsin Friday at 7:27 ET on TBS.